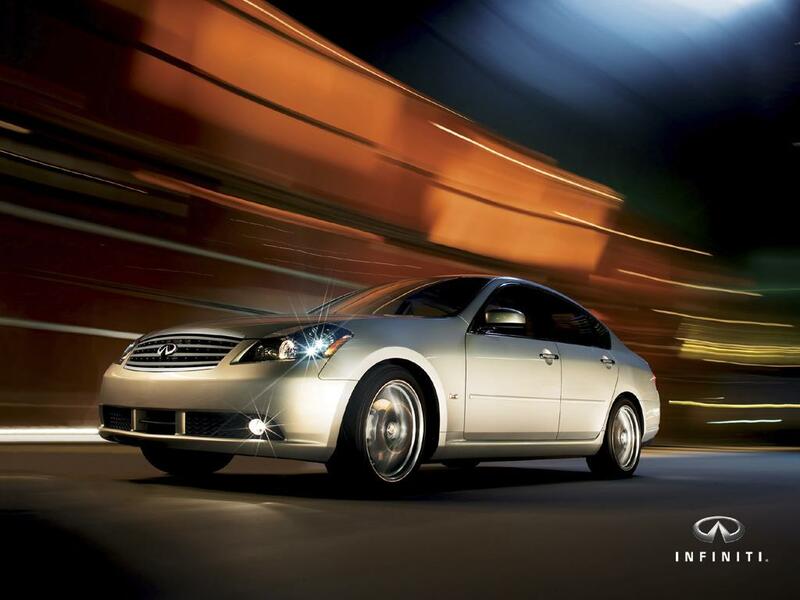 San Francisco: With the new M45, Infiniti makes another move forward in its search for the perfect luxury contender in each segment. With the legendary Q45 sedan at the top and the G35 holding down the affordable sedan and coupe role at the bottom, the M45 slots in between nicely. It blends the power of the Q’s 4.5-liter V8 with less mass and a style all its own. The M series is completely redone this year, and that’s a good thing. The previous model, based on a Japanese Nissan, was a clean design but came off as somewhat boxy and dated looking compared to Infiniti’s fresh shapes. For 2006, the M wears the filled out, tightly sculpted lines seen across the Infiniti and sister brand Nissan products. The M is available in two series. The M45 uses the corporate 4.5liter V8, which is good for a rousing 335 horsepower and 340 lb.-ft. of torque. No wonder the car leaps ahead when you stab the gas pedal. You can still get boatloads of performance with the M35, which employs the hearty 3.5-liter V6 that graces cars like the G35 sedans and even the Nissan 350Z. It puts out a generous 280 horsepower and 270 lb.-ft. of torque. Both models come standard with a five-speed automatic transmission that’s set to up give you manual, clutchless shifting. Each car has a premium-packaged Sport version and the M35 offers an all-wheel-drive version. My tester received EPA fuel mileage ratings of 17 City, 23 Highway. The 116-pounds-lighter M35 improves that number by only 1 City and 2 highway respectively. The car’s trip computer told me that I earned an average of 17.4 mpg during my test week. My Umbria Grey test car impressed with its generous use of real wood in the cabin. The quantity of rosewood veneer slathered all over the interior gave the car the feeling of a cozy paneled den. For those who can remember the original Q45, which featured absolutely no wood inside (but plenty in its advertising), this is an exquisite bit of irony. The leather-covered chairs offer firm comfort; the driver’s has 10-way power adjustment in addition to power lumber support, and the passenger has a six-way power choice. Chrome accents and rich brown hide and vinyl provide a swanky feel. Especially unusual in the M is the shape of the center console, which is nearly parallel with the ground at its top. You input control selections downward, as on a piano, rather than forward like a doorbell. This takes a little getting used to, but everything is well marked and illuminated. The Infiniti controller uses a central wheel surrounded by buttons that let you select from some of the car’s features. Similar in concept to the German manufacturers more complicated systems, this one works pretty well after a bit of familiarization. There’s a generously sized display screen that makes it easy to view your selections from the audio, trip computer, climate system, and navigation system, if you have one (it’s a $2,000 option). My car had the optional Journey Package $2,750), which adds an incredible Bose 8-speaker audio system, front seats that provide hot or cold, self-leveling xenon headlamps, and a rearview monitor. This last item displays a clear, full-color video of what’s behind you when you’re using Reverse. This is a growing trend in today’s vehicles, and it is helping prevent damage and injury for the lucky families who have it. As part of the 21st century high-tech, the M45 gets an Intelligent Key. It’s so smart that it can activate the car’s starter from inside your pocket; all you do is press the Start button. Intelligent Key also allows you to simply walk up to the car, press a tiny button on the door handle, and step on in. I got used to this casual deal in a few days, and my following test car seemed slow and annoying by comparison. It seems that today’s kids can’t go anywhere without listening to or watching something. My tester had the optional Mobile Entertainment System ($1,500), with an 8-inch ceiling-mounted fold-down display. It came with a remote and two wireless headphones. Forget about noisy family chatter about out-of-state license plates and giant cement dinosaurs. Junior can sit back and watch Shrek for the 12th time as the Interstate miles roll by. The M45 is very pleasant to pilot, thanks to a long wheelbase, large 18-inch wheels, and short body overhangs. The engine is mounted behind the front axle, for greater weight balance, or at least that’s what Infiniti’s press folks told me. I know that for a two-ton sedan, the M was quite spirited.